In no time at all, gardeners will be flocking to nurseries to buy annuals for their gardens. It’s exciting to be able to dig in the soil once again and add that instant splash of color only annuals can provide. But before you dig, we have some tips for you to consider. Avoid annual islands. It may sound a bit counter intuitive for a landscaping company to say, but we would love to arrive to a garden at year three or later and find no room for mulch. The last thing you want is an annual surrounded by a sea of mulch for most of the season. So if you garden with a lot of annuals, plant them thick! Consider adding additional perennials and shrubs to claim more garden space. They provide a great backdrop or contrasting elements for the annuals and give you interest in the garden that extends beyond the first hard frost and starts well before the traditional first day of gardening. Container gardens. The amount of annuals to really do a bed well can be intimidating. 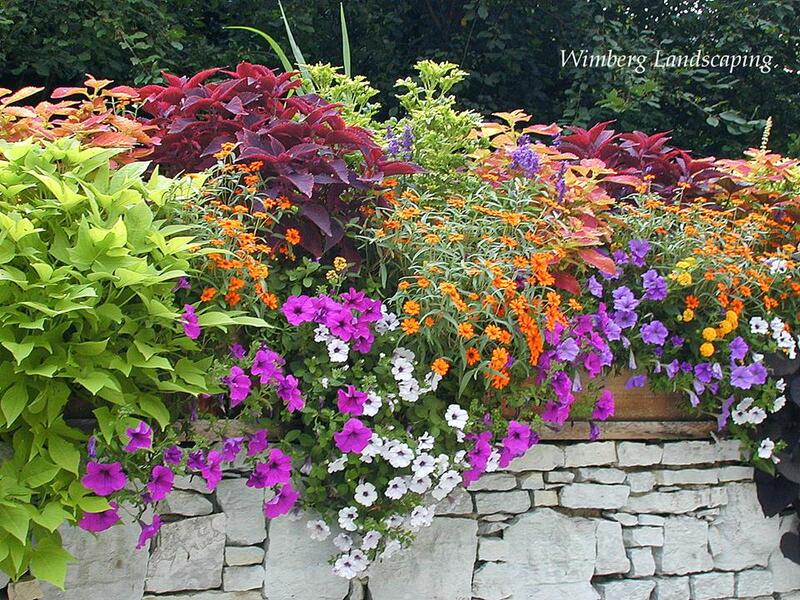 Instead of planting annuals in the beds consider planting containers overflowing with annuals on the porch, patio, staircase and even tucked throughout the gardens. You can create dramatic looks with fewer plants, they are easy to care for since they are clustered together and the container, should you choose a frost-proof variety, becomes winter interest. Choose wisely. Not all annuals work well together. Just like perennials, trees and shrubs, you need to consider the plant’s required growing conditions and if you are combining annuals, which we highly recommend, make sure they all carry the same requirements. But you are not done, yet! If you are working your annuals into an existing perennial garden, the growing requirements for all the plants must be cohesive or the garden will be a maintenance challenge in the least or disaster in the worse case.